As Arizona death row inmate Joseph Wood gasped and gulped for air, prison officials kept pumping more drugs into his system. It took 15 injections and almost two hours for him to die. The botched execution followed other court-ordered deaths in Ohio and Oklahoma in 2014 that were supposed to be pain-free and humane but ended up horribly bungled. States are having problems because it’s increasingly difficult to get effective, reliable, government-approved drugs for executions. As a result, lethal injections have become messy testing grounds for experimental drug cocktails. And now states are scrambling to find other options — including gas chambers and even firing squads, recently reinstated (though not yet utilized) in Utah. The pressure on the 31 death-penalty states is growing because drug suppliers are increasingly pulling out of the death business, making it more difficult to find alternatives to the primary drug used for lethal injections: sodium thiopental, a barbiturate no longer manufactured in the United States. In the absence of locally sold barbiturates, some states have looked overseas to purchase the drug. But in 2011, the European Union imposed a ban on the use of European-manufactured drugs in American executions. This forced some state governments to turn to local compounding pharmacies — which create drugs from basic ingredients — and untested barbiturates for executions. But even though several state governments promised compounders their identities would stay secret, few of the pharmacies were willing to risk being identified and stigmatized. The supply problem highlights a long-standing issue with the medicalization of lethal injection drugs: the lack of scientific evidence of their effectiveness. While sodium thiopental is an effective anesthetic, it is often used in combination with two other drugs — one that speeds up the heart until it stops and another that paralyzes the rest of the body’s muscles. Yet how the combination of drugs work together has never been tested or sanctioned by the U.S. Food and Drug Administration. The dosage of drugs used for the death penalty is also arbitrary, according to Deborah Denno, a law professor at Fordham University in New York City. And since medical professionals and pharmaceutical companies refuse to be associated with the process, there are no controlled trials, analysis or peer-reviewed literature to guide how much of a drug prison officials need to administer to death row inmates. And if the drugs are contaminated by tiny particles — as drugs manufactured by compounding pharmacies often are — they can burn and scrape the insides of veins like sandpaper, instead of having an anesthetic effect. Some states like Maryland, Illinois and Connecticut have responded to the growing controversy by abandoning capital punishment, but most death-penalty states are sticking with it, perhaps because polls show that public support for the death penalty hasn’t wavered much in recent years: six in ten Americans still favor it. To some capital punishment supporters, older methods such as hanging, electrocution and the firing squad are still viable options — even though those methods had been dropped because they were less humane than injection. But hanging is still a legal method of execution in Delaware, New Hampshire and Washington, and could potentially be used as a backup if those states give up on lethal injections. Utah’s reinstatement of the firing squad last March, 11 years after abandoning it, means that the Beehive State has its backup method back in place. And the electric chair remains an alternative option to lethal injections in Alabama, Tennessee and six other states. Even as states lay the groundwork for alternatives though, lethal injection remains the preferred choice in all 31 death penalty states. To switch to a different method, state governments would need to certify that reliable injection drugs were not available before using their backup method, according to Benza. “The real problem with the other methods is the way they look. 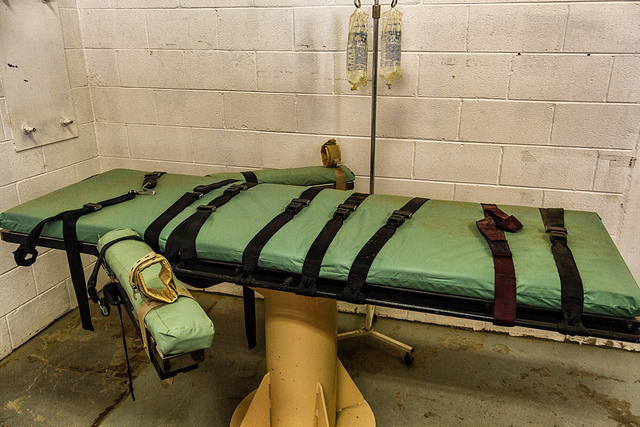 They are not as aesthetically nice as lethal injections,” Benza said. But states are free to choose any alternative execution method as long as it complies with the Eighth Amendment’s prohibition against “cruel and unusual punishment,” according to Denno, of Fordham University in New York. In Oklahoma, a suggestion from an old friend of a state legislator led to a new law designating nitrogen gas as a viable method of execution, set to take effect this month. Oklahoma hasn’t yet established a protocol to use the gas in executions, and it’s possible that the state would utilize a gas mask or a small tent instead of a room-sized chamber, but its similarity to methods the Nazis used in the mass extermination of Jews and other minorities is already stirring passionate opposition and likely legal challenges. Some have likened it to the use of cyanide gas in California’s San Quentin state prison, where nearly 200 prisoners were executed before the method was abandoned in 1994 due to similar parallels being drawn to Nazi gas chambers used during the Holocaust. Some lawmakers in death penalty states have become so fed up with all the legal and ethical challenges that in 14 states they’ve introduced bills to abolish capital punishment entirely. But these repeal efforts have a history of falling short. In May, the Nebraska legislature voted to abolish the state’s death penalty, but Governor Pete Ricketts later vetoed it and the proposed ban is now scheduled for a statewide referendum in November 2016. Opponents of the death penalty are planning to keep pushing, and say the problems with execution drugs are only strengthening their case. The botched executions and lawsuits that follow are increasing public awareness of the issue. And the scrutiny will only keep increasing as people realize the uncertainty that surrounds use of lethal injection drugs, according to Ray Krone, a director at Witness to Innocence, which is an organization that provides a support network to and empowers exonerated death row survivors. Krone has personally lived through the experience of being wrongfully accused for murder and waited on death row for three years. “It’s a failed policy,” he said. The fight is likely to drag on for years, because most states are not in any hurry to resume executions. In fact, most of the 31 states that have capital punishment have not executed any criminals for at least eight years. “There is no rush amongst most states to do anything because the death penalty is not being actively pursued by most states in the country,” said Dunham of the Death Penalty Information Center. A few death penalty states, though, are pushing hard. Texas, Missouri and Florida are responsible for 80 percent of executions over the last two years, and plan to keep going. Other states that have been searching intensely for drugs that can be used in lethal injections include Arkansas, Arizona, Georgia and Ohio. Arizona has already gotten into trouble with the federal government in its search for execution drugs. Two of the state’s three proposed cocktails require sodium thiopental. Since it’s no longer available in the U.S. or through Europe, Arizona tried to illegally import some from India, but the drug was seized by the Food and Drug Administration at the Phoenix airport. The third proposed drug cocktail relies on midazolam, the controversial sedative used in Joseph Wood’s botched execution. That is the drug that inspired U.S. District Court Judge Neil Wake to put a hold on lethal injections. It has also led to a lawsuit against the state in the wake of Wood’s execution. Worried that Arizona might use midazolam for other death row inmates without disclosing the information, attorneys are fighting for a more transparent procedure. The solution is to abolish the death penalty.